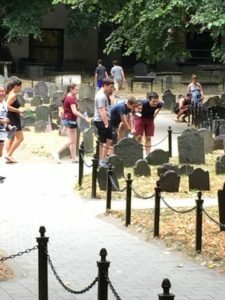 On day 30, Etgar 36 had the pleasure of exploring the city of Boston, which was by no means boring. 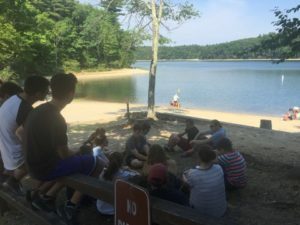 First, we traveled to Walden Pond where writer and philosopher Henry David Thoreau lived for two years in seek of a quiet place to write. Thoreau was an extremely wise philosopher and writer of the essay “Civil Disobedience”, which discusses the idea of protesting a cause without the use of violence. This concept, itself has made a major impact on the world we live in today: Ghandi used Thoreau’s idea of civil disobedience as a way to fight for Indian independence, and Dr. Martin Luther King Jr. used the same concept as the basis for the civil rights movement. 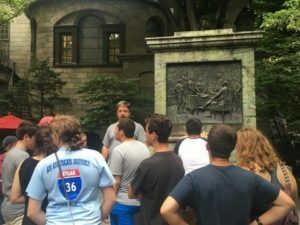 These protests would have most likely ended with much different results had it not been for Henry David Thoreau and his writings. After having been to the Walden Pond, I can understand why he made this decision; the area is beautiful. There, Etgar as a group had the chance to study some of his quotes and ponder the messages being portrayed through them. 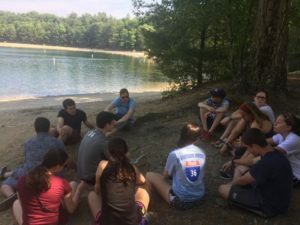 Thoreau’s work emphasizes the impact that an individual can have on the world and on society, and also empowers others to try and do so. 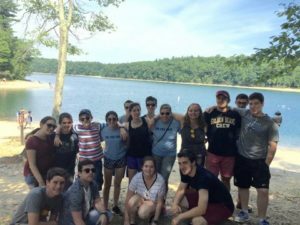 My experience at Walden Pond was truly inspirational. Following our visit to Walden Pond, we stopped at Harvard Square for lunch. 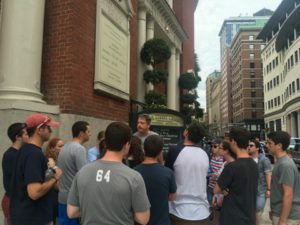 During that time, we had the pleasure of observing and exploring the streets of Boston. The city’s atmosphere is both mature and quiet; something that is much different than that of the busy and loud New York City streets. 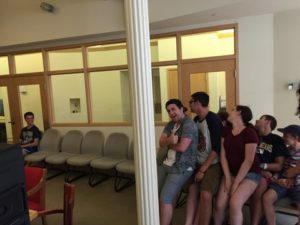 It is fair to say that most of us thoroughly enjoyed our time in the Harvard Square. 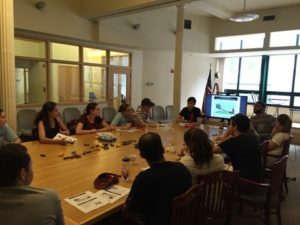 Following our fabulous food outing, Etgar met with United for a Fair Economy: an organization that is challenging the concentration and distribution of wealth in society. The UFE explained many statistics pertaining to the wealthy and the working families. The top 1% makes $423,030 a year, but the bottom 20% make -$29,100 a year. In addition, there have been sizable tax breaks for the wealthy, but barely any tax relief for the working class. Lastly, White men and women are are making significantly more money than Black men and women and Latino and Latina men and women. These are the facts. The issue at hand is, how are those in the bottom 30% going to improve economically? Since money coincides with opportunity, and opportunity. coincides with success, which directly correlates with income and power, it seems difficult in today’s society for working families to find chances to overcome these statistics. Somehow, there needs to be a way to level the playing field and allow for a more fair economy. I found the meeting with the UFE to be extremely eye opening and informative. Today’s meeting has definitely raised my concern on the issue. 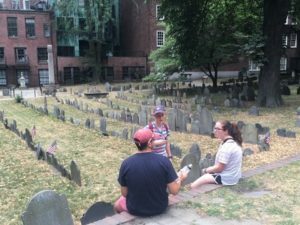 After meeting with the UFE, we explored the freedom trail. 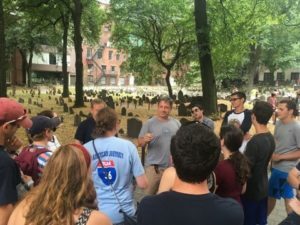 On it we visited the site at which the Boston Massacre happened and where Paul Revere engraved the memory of it, as a method of propaganda against the British. 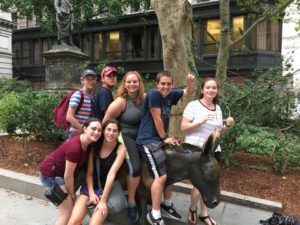 Conveniently, the Freedom Trail lead us right near to the Quincey Market, where we all enjoyed great food from lobster to fantastic mac and cheese. In addition, we also had the opportunity to explore some of the local stands of Boston apparel, as well as some stores. 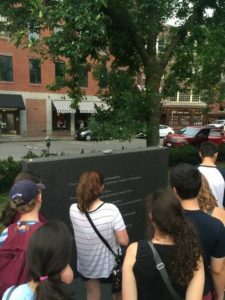 Lastly, we paid a tribute to those who passed during the Holocaust at the Boston Holocaust Memorial. 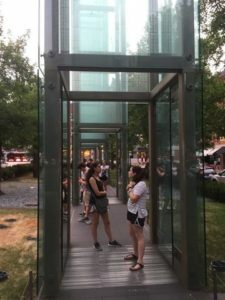 It included monuments to represent each concentration camp and underneath them, hot sparks with smoke to symbolize the gas chambers and crematoriums used on those oppressed. 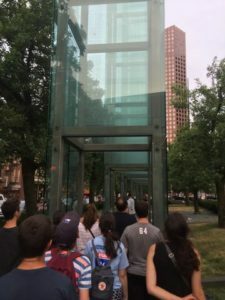 I won’t lie, walking through the memorial was quite unsettling. Nobody can ever forget the tragic, dehumanizing events that occurred. If we do, we open ourselves up to the chance at history repeating itself. History cannot repeat. I as well as many others, found today to be inspirational, informative, and empowering. I cannot wait to experience what tomorrow has in store!